Come fish with us in the Fabulous Florida Keys! Come fish with us in the Fabulous Florida Keys! Key West Fishing at its best! The Key West area is full of great fishing opportunities. The Key West Fishing Club has been around for the better part of 20 years in some way, shape or form. It was started by a long time Key West resident and he had a great concept about making each angler a new member of the club once they had come to Key West and gone fishing with him or another one of his guides. It was old time Key West fun and the trips were customized for each family or corporate group to ensure they came back smiling. Boats like Tarpon Tuesday, Wahoo Wednesday, and Sailfish Saturday were seen fishing offshore, and in the backcountry, the Bonefish Sunday. Folks loved coming back to see the guides from the Key West Fishing Club year after year, and today we still carry the same tradition with newer equipment and the best guides and captains in Key West. 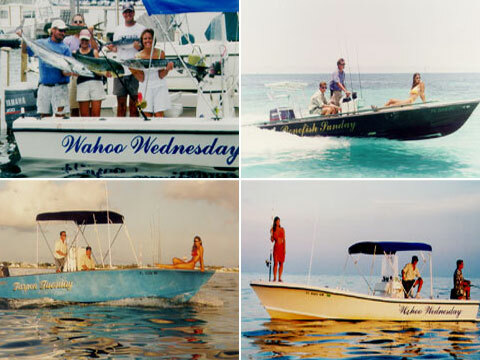 We want you to have a great time while you are here and will offer to book your fishing trip and give you many suggestions of places to stay in Key West, and other things to do and see. Take advantage of our summer season for tarpon fishing, abundant bonefish and permit in the Key West backcountry, wreck fishing for Permit, Snapper, Grouper & Cobia, or deep sea fishing for mahi mahi, sailfish and wahoo. Key West is at the end of the Florida Keys island chain, a short drive from South Florida. Key West has a lot to offer to saltwater fisherman as well as non-fishing companions.